The tragic deaths of two young men who crashed into the back of a school bus Tuesday morning, May 17, may have involved two of the most serious dangers threatening drivers today: alcohol and distracted driving. The car, a 2002 Mazda Protégé, wedged underneath the bus when it hit. Myers was killed in the crash. Ray died later that morning at Moses Cone Hospital. There were 18 students on the bus: Nine from Southeast Middle School and nine from Southeast High School. None of the students was hurt. The bus driver, Pat Neese, also was not injured. School officials praised Neese for her handling of the crisis and getting the students off the bus safely. Evidence suggests that distracted driving may have been involved. The bus’s warning lights were flashing and its stop arm was extended, making it as visible as possible. In addition, the car was going an estimated 55 to 60 mph, investigators said, and didn’t appear to have tried to stop or slow down. And, according to Trooper Greg Ingram, beer cans were found inside the car, making alcohol a possible factor. This will be determined by toxicology testing. Whatever the factors, the fatalities of this 20-year-old driver and his 21-year-old passenger are a terrible loss. The grief of their families will be excruciating, no matter who is responsible or why. It’s sheer luck that the 13-year-old 7th-grader who lives in the house where the bus was stopped had gotten safely on the bus and in his seat before the crash. If he had been climbing the steps of the bus he would likely have been seriously hurt. If he had been directly in front of the bus his injuries could have been worse, or even fatal, if he had been hit when the bus was jolted forward by the extreme impact of a 60-mph collision. 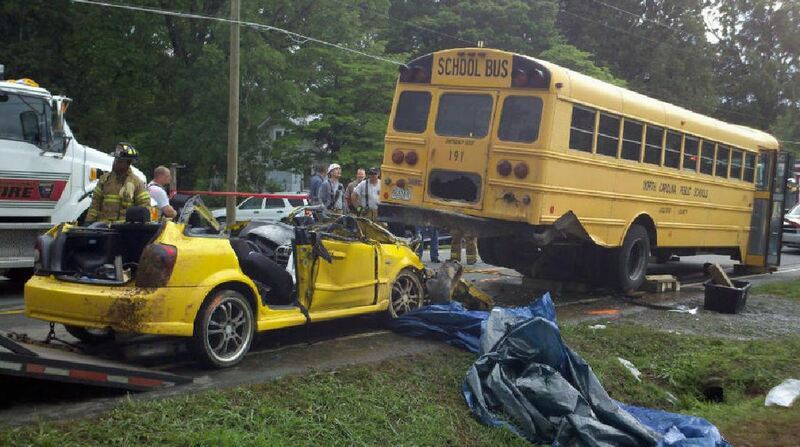 We can also just try to be thankful that the driver of the bus and the children on it were not physically injured. But the trauma the impact and ensuing events will be with them always.